These ‘mordants’ help to bind dyes to the cotton and string. b. They were placed in a vessel and 50 ml ‘extraction’ solution with different ph values were chosen and added to the natural materials. c. They were ‘heat extracted’ by placing in the microwave for 3mins or 70°C bath for 20mins. a. Filter extracted dye with a piece of muslin in a funnel filter the dyes into a clean vessel. c. Heat samples in the water bath for 30mins. d. Wash and dry samples after 30mins. 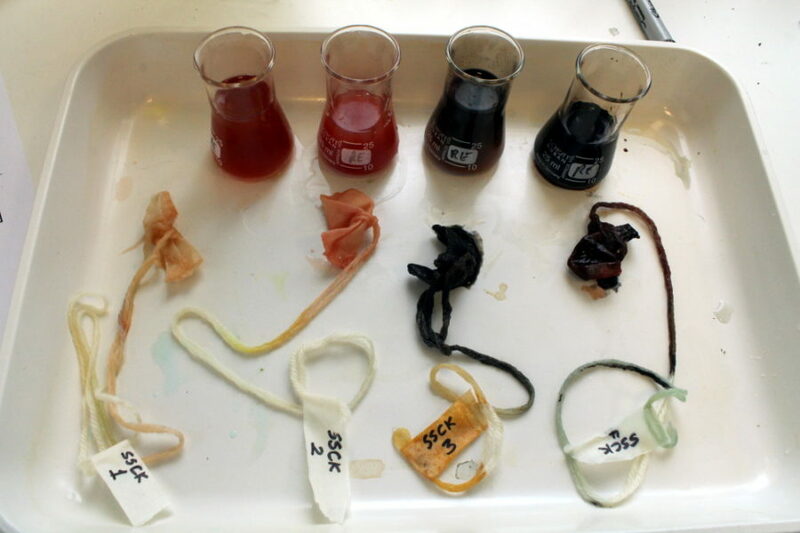 Colours and intensity varied- samples could have been left longer in stage 3. A natural / chemical ‘fixative’ could be applied.